In this published work, Novel Three Dimensional Human Endocervix Cultures respond to 28-day hormone treatment (1) , the authors’ goal was to develop a robust three-dimensional (3D) endocervix model that was a reliable representation of the in vivo tissues and to identify the physiological responses to changing levels of steroid hormones during a 28-day time period. Human endocervical cells were grown on polystyrene scaffolds and the morphologic and hormonal responses of cultured cells were assessed in response to fluctuating levels of estradiol (E2) or progesterone (P4). 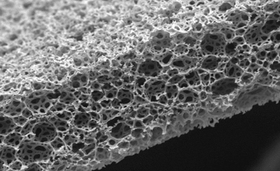 To achieve this, a highly porous polystyrene scaffold, Alvetex® (Reinnervate Ltd) was used for 3D culture. The membranes are 200 microns thick with pore sizes of 36–40 microns and the 12-well transwell format was used. The Alvetex product range is available to researchers in Europe, for more information don’t hesitate to ask your questions below.